Is it possible to make real progress on data quality and accessibility? If you want to avoid spending a fortune on data warehouses that become data ruins, or data lakes that become toxic swamps you have come to the right place. At Anmut we help you build a data management plan, architecture and design that will deliver real business benefit and real progress towards data maturity. We have distilled our many years of experience in Data Management into practical steps that deliver real results in measurable steps. Organisations succeed with Data Governance when the why is crystal clear, and progress towards it is a board level agenda item. They fail when it is seen as a technology issue. Most organisations fail. Does the proposed governance approach create more value, can it be proven? 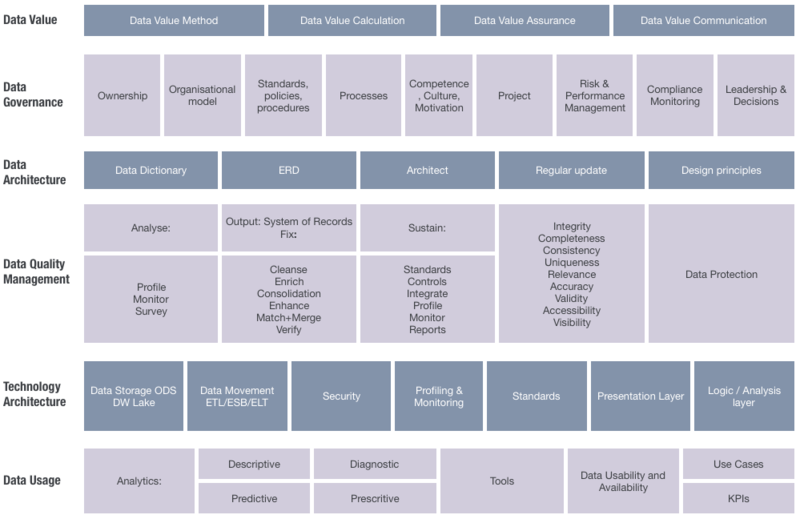 Are business leaders accountable for delivering the related data value? Is the investment commensurate with the value created or protected? Once the why is clear and strongly supported we help you design the enabling processes, policies, procedures and technology. We also help you update the performance management measures to reinforce the desired behaviours. If you want want to achieve value based data governance; Anmut is the only organisation that can help. What data is needed? How should it be organised? Who needs access to it? These are the key questions upon which effective data architecture should be built. Most organisations design their data architecture in a strategic vacuum, focussing on specific frameworks and technologies, failing to answer these fundamental questions. This results in spending vast sums with minimal return. Anmut takes a different approach: we help craft architecture that is strategically based on value. We build upon your current architecture to put the most valuable data in the right place at the right time. Great technologies can be real enablers of an innovative business strategy. Applied in tandem with a strong data architecture they can help deliver a sustainable platform for success. The market for data technologies is vast and complex, it is very easy to end up on a desert island. Let us help you chart the right data technology course, make the smart investments and make landfall at the right destination. Having the right analytical skills, tools and processes deployed in the right structure can deliver significant saving and much higher analytics outputs. We help you design your competencies, organisation, processes and tools to ensure you get better value out of your scarce analytics skills. World class data quality management is a balanced combination of process, tools, competency and a quality philosophy. At Anmut we bring the same disciplines developed for Total Quality Management to the data space. We help you design and implement a sustainable data quality management approach that delivers better margins, higher customer satisfaction and less rework. We start the process by diagnosing your tools, processes and competencies to understand where the best investments will be. We then help you design each element to be measurable. Fill out the form below, and we'll get in touch. Copyright © 2018 Anmut. All rights reserved.